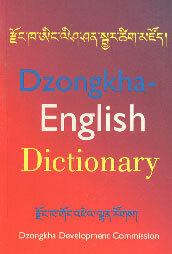 The Title "Dzongkha- English Dictionary " is written by Dorji Gyaltshen. This book was published in the year 2002. The ISBN number 9993615005|9789993615002 is assigned to the Paperback version of this title. The publisher of this title is Dzongkha Development Authority, Ministry of Education. Dzongkha- English Dictionary is currently Not Available with us.You can enquire about this book and we will let you know the availability.